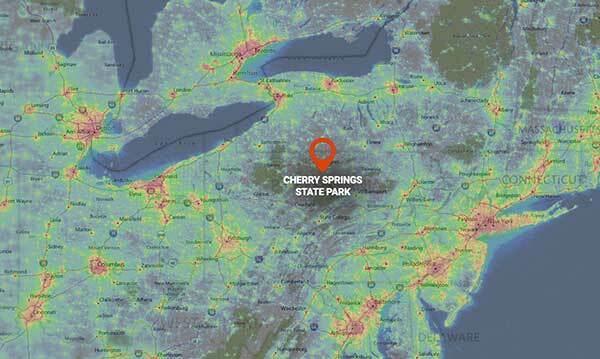 The Cherry Springs Star Party is an annual astronomy event held in Coudersport, PA. This incredible gathering of amateur astronomers always coincides with the new moon for truly breathtaking views of the Milky Way. The lack of light pollution in this area is the reason for a truly unforgettable view of the night sky. This year, my Fiance and I made the 3 and a half hour drive from Ontario to Cherry Springs State Park for 3 nights of astronomy camping. This is the closest dark sky preserve from my home in St. Catharines, Ontario. Naturally, I brought all of my astrophotography equipment to capture as much of the unspoiled dark skies as possible. The dark skies and imaging-friendly environment make the Cherry Springs Star Party an astrophotographers dream. I did my best to capture the excitement of this event, as well as the comradery of the night sky aficionados that attend each year. 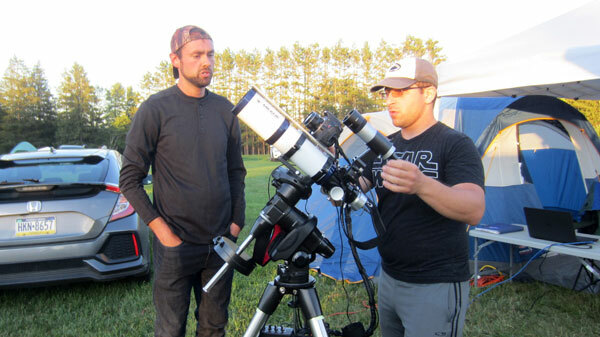 Have a look at the video below to get a feel for what the Cherry Springs Star Party is all about. If you have never been to a star party before, you may be wondering what an event like this has to offer. 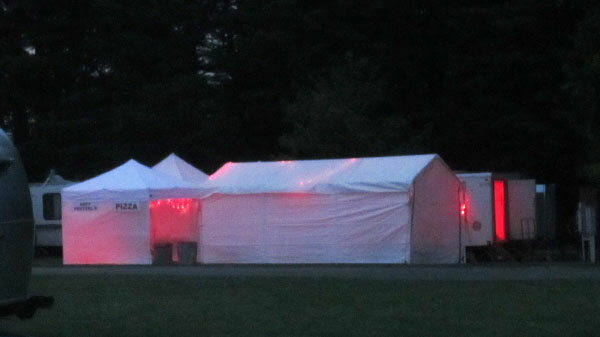 The CSSP (Cherry Springs Star Party) is put on by the Astronomical Society of Harrisburg PA. They handle everything from registration to lining up a number of speakers to give an astronomy presentation. The presentations happen throughout the event during the day in the rustic pavilion located in the park. These talks can be anything from a Solar Eclipse to astrophotography and are delivered by an expert on the subject. The team at ASH (Astronomy Society of Harrisburg) organizes a door prize raffle as well. Some notable prizes this year included a mini Solar Eclipse Dobsonian telescope and a Teleview eyepiece. The two tickets I entered in the draw for an Explore Scientific eyepiece got lost in a sea of competing tickets! 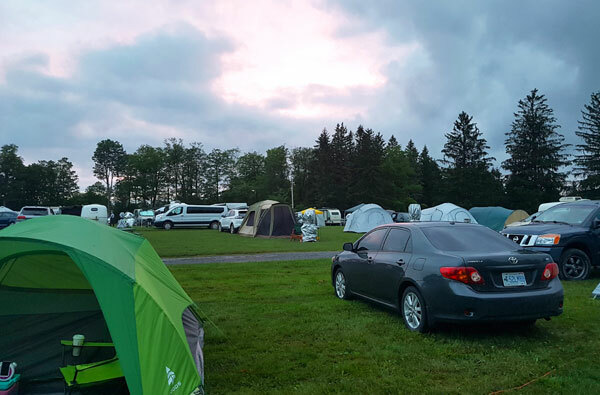 The astronomy observation field is packed with campers staying in everything from a small tent to large RV. Astronomers from near and far meet with each other to talk about their gear and catch up. It’s a great place to try out new equipment and see what others are using to observe and photograph the night sky. You’ll find massive Dobsonian telescopes with supersized mirrors of 25″ or more on the observation field. If you are lucky enough, you might be able to convince the owner for a peak throughout the night. Being respectful of others during the night is essential, as some of the guests are making serious observations or imaging. A dim red headlamp is a must, and even then you must be conscious of others around you when using it. The grounds were designed specifically for astronomy, and even dons the prestigious IDA (International Dark-Sky Association) badge at the front gate. This means that during the star party, no white light of any kind is permitted on the grounds. Even the bathroom facilities use only red lights. One of my favorite features of the Cherry Springs Star Party is the 24-hour snack bar. That’s right, you can order a slice of pizza and a cup of coffee at 3 am. My kind of place! The staff operating the snack bar was incredibly friendly and efficient considering the unexpected volume of merchants that would appear at a moments notice. It is important to respect the rules of this extraordinary park, and the visitors who drove many miles to appreciate it. Some of the astronomy-specific rules include no open fires (obviously! ), quiet time in the morning, and no pets. This star party is serious about delivering an unforgettable night underneath the stars. However, the real fun takes place at night of course. Looking up on a clear night at Cherry Springs is truly a site to behold. As dusk begins to set in, the brightest stars begin to appear. A short time later, the iconic constellations form into live diagrams straight out of your astronomy book. Even with the night sky 30 minutes away from absolute darkness, there were more stars than I could ever observe at home. The Milky Way becomes present during late dusk and then proceeds to dominate the sky in a way that seems impossible to ignore from any location. Yet, for many people, a view of the Milky Way is a something they have never experienced before. I captured the photo below on Saturday, June 24 at the 2017 Cherry Springs Star Party. Click the image for a larger version. I manually stacked the individual 90-second images in Adobe Photoshop. 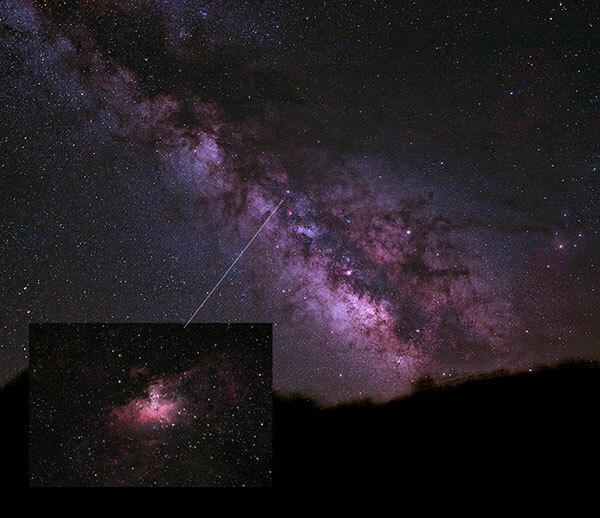 Here is a Milky Way image processing tutorial that describes the method I used. Another method for processing the image would be to use DeepSkyStacker to register the image frames automatically. Rather than controlling my digital camera using the computer, I used a simple remote shutter release cable to automate my imaging session. I set up 2 separate imaging rigs up to capture both deep-sky objects and a wide angle landscape image of the Milky Way. The wide field equipment included an iOptron SkyGuider Pro with my Canon 450D and 17-40mm lens riding on top. This was the rig used to capture the image of the Milky Way you see above. The iOptron SKyGuider pro was graciously provided by my official partner, Ontario Telescope and Accessories. Most of the equipment I use for deep sky imaging in the backyard is available from OTA! Unfortunately, much of the footage I shot at Cherry Springs where I talked about the gear I was using, was unusable due to poor audio quality. The deep sky setup I brought to the CSSP is my standard DSLR astrophotography setup I recently featured in a YouTube video. This includes an Explore Scientific ED102 Telescope on a Sky-watcher HEQ5 tracking mount. This setup has never looked quite so humble as it did in a sea of large Astro-Physics refractors at the Star Party! This park also hosts the Black Forest Star Party later this year in September. The BFSP offers views of the Milky Way much later in the season with longer (and colder) nights. I’d love to attend this star party soon as well. 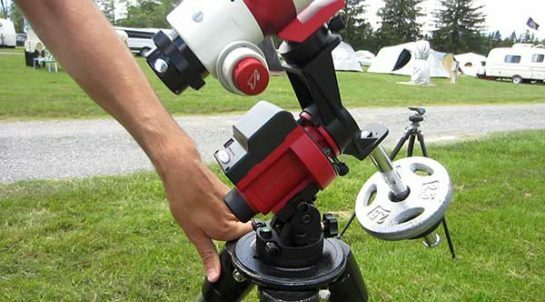 The Black Forest Star Party takes place September 22-24 this year. My fiance and I enjoyed the trip! As for the CSSP in June, I plan on attending every year from this point forward. The excellent facilities, friendly people and the connections made at this event have left a lasting impression on Ashley and I. I was a real treat to meet a few fellow astrophotographers at the event who recognized me from my YouTube channel! Below, you’ll find the two deep-sky objects I photographed while attending the CSSP. My goal was to capture some of the summer targets that sit too low in the Southern sky from my backyard. With a limited imaging window, I opted to capture about 1 hours worth of exposure time on both M16 and M20. From my location on the observation field, the tallest trees blocked some of the lowest objects in Sagittarius for the first hour or so after nightfall. For that reason, I chose to image the Eagle Nebula first, as it reaches further away from the horizon than the others. 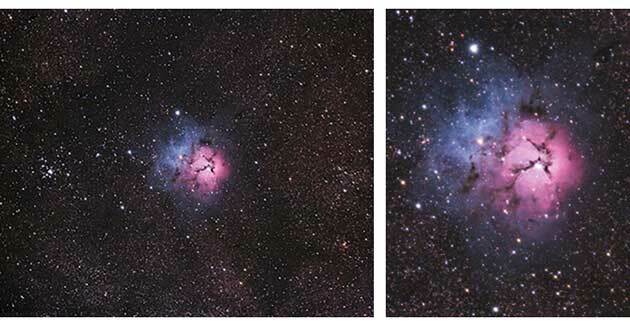 Both the Trifid Nebula and Eagle Nebula are identifiable in my Milky Way image. Below, I’ve included an inlay that shows exactly where M16 resides. It was a real treat to photograph the Milky Way and some deep sky objects at the same. The iOptron SkyGuider worked really well, considering this was my first attempt in a scenario like this. 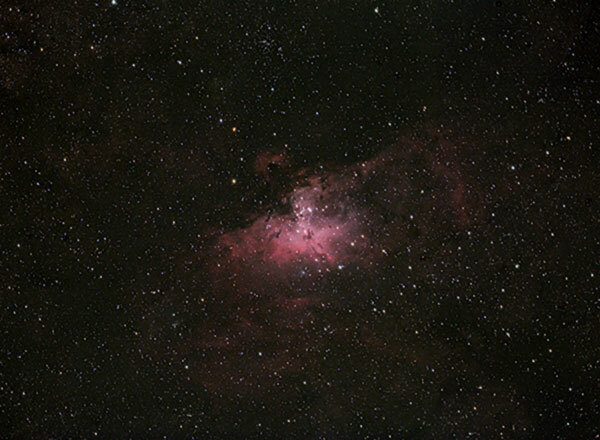 Here is the image of the Eagle Nebula captured that night. 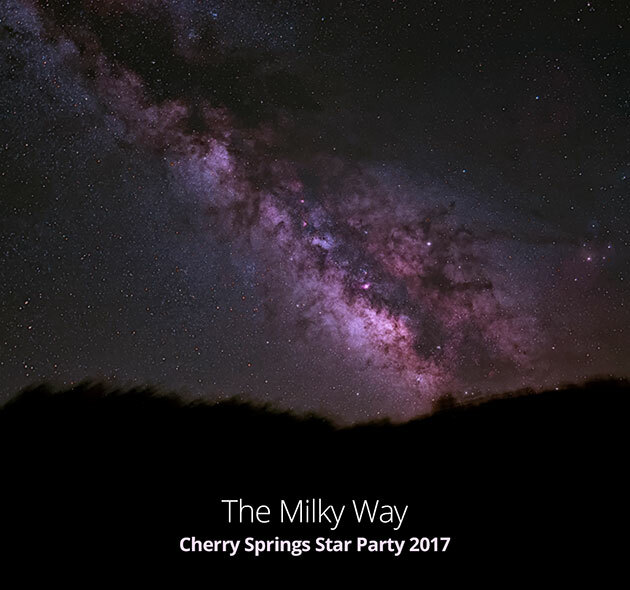 If you plan on attending the Cherry Springs Star Party next year, be sure to register at the CSSP website. 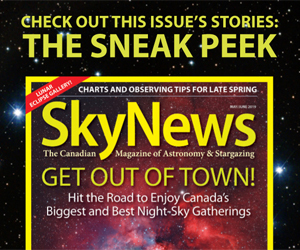 Please subscribe to the AstroBackyard Newsletter for my latest updates! 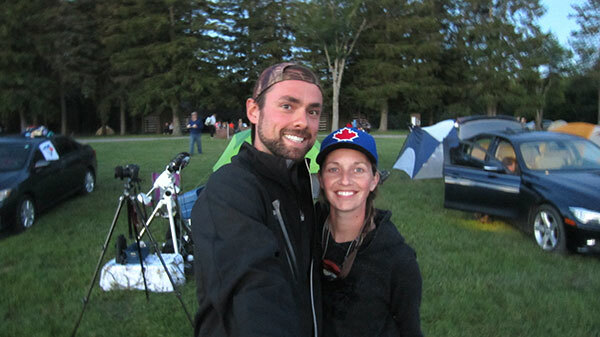 Trevor – I love Star Parties too, although I have only attended the Southern Saskatchewan Star Party. Great facilities there also which gets approval from the wife. It’s always nice to know you’re not the only nerd out there, isn’t it? I showed up with with a $65k truck and and a $40k trailer and set up my $3000 worth of Skywatcher equipment. 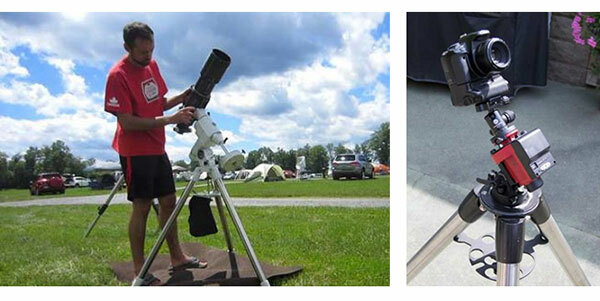 The guy next to me pulled out his $65k Dobsonian from his $3000 1985 RV…and then it hit me, “I’ve got this all backward”. Tried to tell that to my wife when she got out of the shower in the trailer…it fell on deaf ears. Haha! There were some incredible rigs at the party. Giant Astro-Physics Mounts, Large Takahashi Refractors, Massive Dobs… it was like a car show for astronomy gear. And yes, it is refreshing to be around so many people who understand your passion and respect the dark skies. Just an incredible energy there in more ways than one! I am a new kid to the show but I cannot wait. I am following you Trevor and respect all your insight. I appreciate you and thank you. I sent an email. I wish you gave workshops.